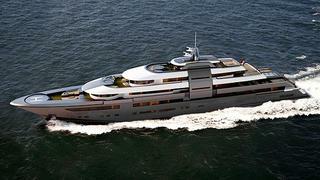 Zuccon SuperYacht Design has completed work on a new 90m motor yacht design. Characterized by a strongly architectural feel, the design focuses on vertical surfaces resulting in a yacht with a sharp and captivating profile. From a functional point of view, great attention has been given to the external space, both in the common and the owner’s areas. Moreover, setting up the green areas as greenhouses and winter gardens, adds a further distinctive and singular touch. There are several distintive features to mention: the four decks, along with the sundeck, are all connected with central stairs and an elevator. The aft deck has been turned into an entrance point onto the yacht, and the designers have moved all guest areas to the upper deck, where they will enjoy more privacy. Inside, the main deck is entirely dedicated to guests, with a large formal saloon, cinema and a bar area with two balconies. Forward there are four double cabins and two VIP cabins, each with a balcony.